The Eagle Has Landed! And I love UPS!! Hot Damn!!! The Dishing up the Dirt cookbook is in our hands. 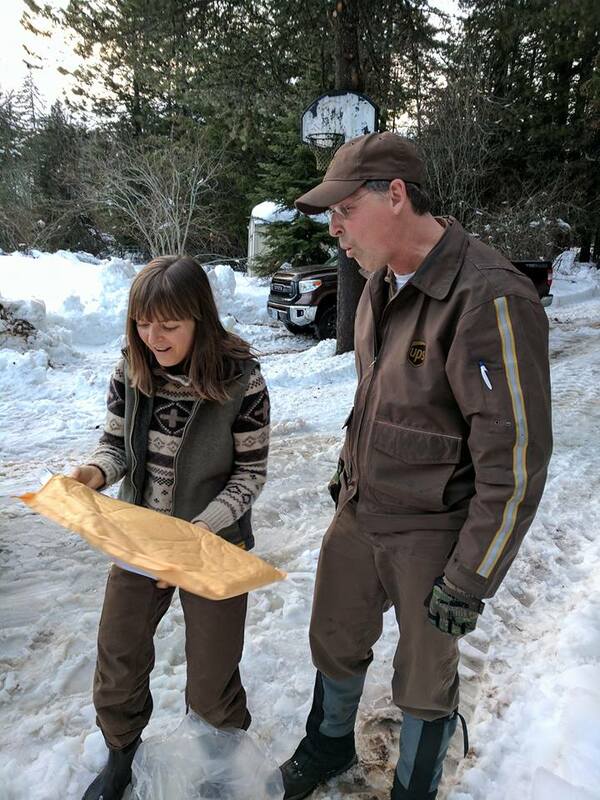 Thank god for the best UPS delivery driver in the entire world. Travis, I’m talking to you brother! Thank you for delivering the best gift of my life and sharing in my joy of seeing my book for the very first time. I love you. After years in the making I can finally say I’m a published author. Pinch me! The Dishing up the Dirt cookbook is more beautiful than I could ever have imagined. I can’t wait for you all to see it! In all honesty, this is not something I thought could happen to me. I’ve never shared this on the website before, but I’m dyslexic and never in a million years thought I could have a published book. When I was growing up (specifically in high school) I thought I was doomed. Finding a career in farming and cooking has saved my life. Both of these trades are hands on work with a concrete sense of accomplishment. I can give my brain a rest when I’m in my element digging in the dirt or spending time in my kitchen. If you’re dyslexic or have struggled with learning disabilities your whole life I hope you know that you can do anything! Hard work, perseverance and a village of folks who believe in you make the world of difference. You don’t have to pursue the traditional path to be successful or find your happiness. And hell, if you find a journal or start a blog you can challenge yourself to write every.single.day. 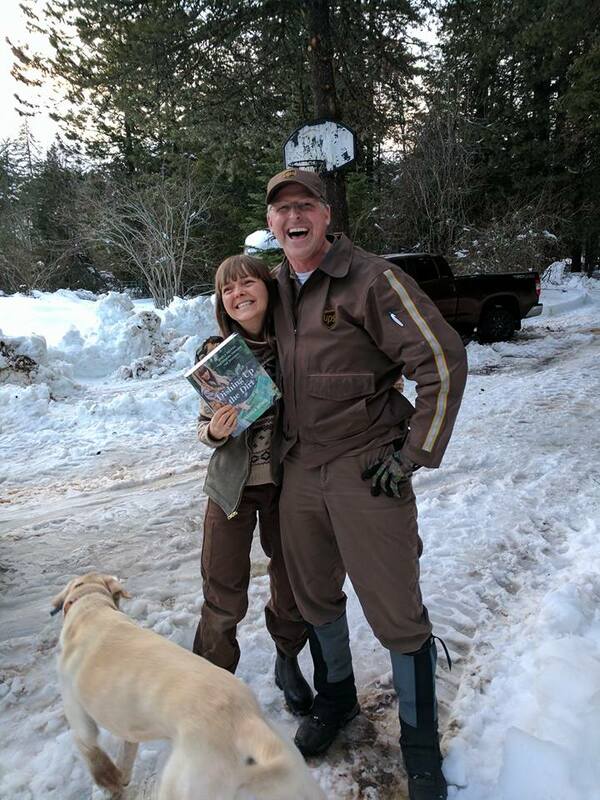 And speaking of happiness….my mom was with me when the DUTD book got delivered. Tears of joy have never flowed so damn hard! We’ve been a sappy bunch of folks over here at Tumbleweed Farm but I’m so damn proud. Taylor finally got to see/read the book for the very first time. I stayed in the next room as he read through everything and hearing him laugh and cry while flipping through the book made my heart explode. This book is not only a compilation of over 100 (NEW) recipes, but is a story about farming, love and community. If you need a good read this is a great place to start! 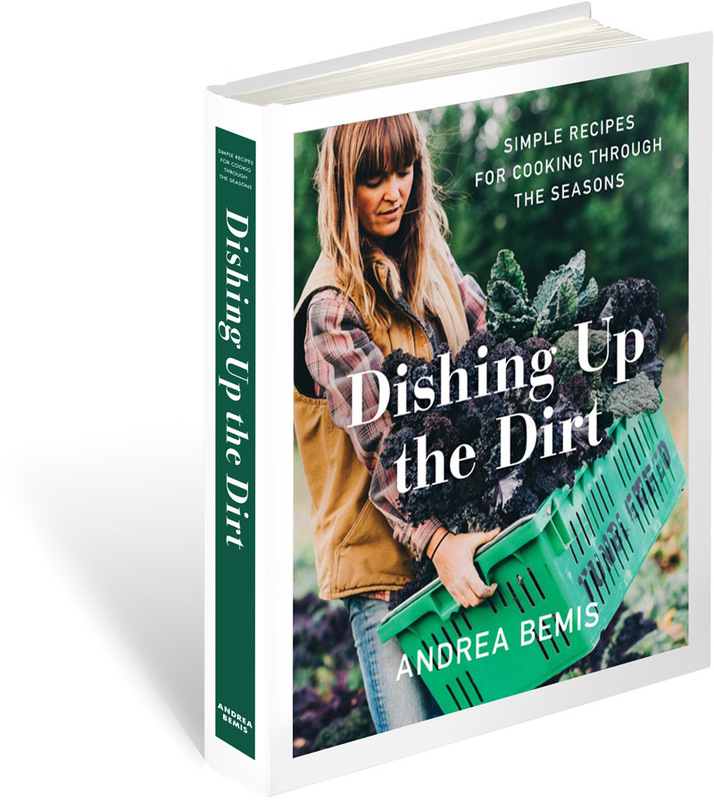 The Dishing up the Dirt cookbook is available for pre-order now and can be at your house on March 14th! If you haven’t order a copy yet please visit these websites to get your order in! Amazon–books will arrive on march 14th! Barnes&Noble–Books will arrive on march 14th. Thank you everyone for your support. I hope this book makes you proud. I’m a bundle of nerves and excitement and cannot wait to hear what you all think. 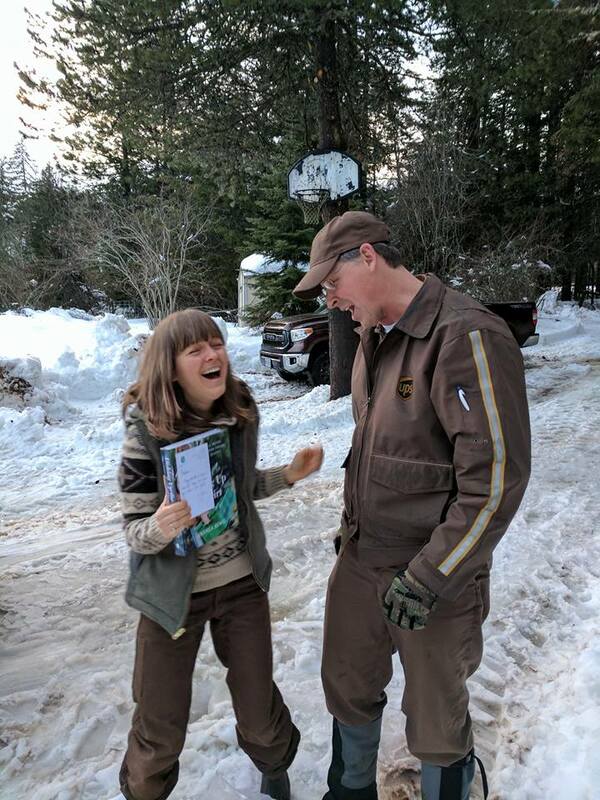 Also–if you get a chance, hug your UPS driver. Or heck…bake them a batch of cookies. These guys make the world go round and deliver the most important packages of our lives. So happy for you! Congrats on a wonderful accomplishment. I am going to order my copy now! Andrea, Love your words! I am printing this page and saving it in the notebook where I save your recipes from this blog. March 01 I ordered three copies of your book – one for me and two to share with my sister and a friend. I cannot wait for it to arrive. I know it will be as wonderful as your blog. Your blog is my stress relief and makes my day. Congrats to you. Well done you. I pre-ordered mine so it should be coming along soon. I have just read this post and it made me cry! I have a 9 year old dyslexic/dyspraxic boy with behavioural challenges, you have passed on hope…. Thanks, we’ll keep on keeping on…. Congratulations! I already preordered my copy! I use your recipes all the time, especially for potlucks and family holidays. They’re delicious, fresh, and unique! I just got a notification that my pre-ordered copy of your cookbook will arrive on 3/15. And I’m going to go grab a tissue now because this post brought tears to my eyes. Thanks so much for sharing the amazing work you’re doing on your farm and in your kitchen. You’re an inspiration, Andrea! Congratulations! I’m so excited for you, and even more excited for me! I’ve ordered 2 copies from Waucoma, who will be sending a signed copy to my best friend for her birthday . We adore your blog, and are always sharing your amazing recipes! It helps keep us connected from a distance, like our own secret club! Thank you, can’t wait to get my hands on it! Yay! Now I know what you got me for my bd… thank you, thank you, thank you, Kathi! I can’t wait to share more DUTD recipes with you. Thank you, Andrea, for sharing your heart, soul, and recipes with us. You’re an inspiration to me and countless others. Congratulations! I have only recently found your fantastic blog and I’m SO happy I did:) I’ve pre-ordered on Amazon and can’t wait! Massive congrats to you and your family!!! Thank you for sharing about your dyslexia. You are going to help even more people. Can’t wait to hear about your celebratory meal and drink. I’m going to pre-order now! Yay!! I cant wait to get my copy on March 14th. I love all your beautiful recipes. The inspire me everyday to eat seasonal and local. Keep up the good work! Do you know how happy I am for you??? SUPER happy!!! I got my pre-order in, for a signed copy, the day you announced it! I have been following Dishing Up the Dirt for a few years and even though I don’t actually know you, I sort of feel like I know you through your stories and the recipes that you share. Reading this post even brought a tear to my eye! I’m so happy for your success and I can’t wait to get my copy of your cookbook and dig into the recipes that I will inevitably cook out of it! Congrats!!! Congrats! I just love your blog and know the book will be great too! You rock!!!! Congratulations on your towering accomplishment!! I can’t wait to receive my copy (which I ordered!) Love to you! This blog definitely needs to printed and added to my books. Can’t wait for them to arrive! I’m going to share these words with the dyslexic kids that I tutor. You are an inspiration! You rock! What an achievement! Can’t wait to receive my copy of your cookbook. And thank you for sharing your story! Love to you! Got the email from Amazon today that the release date was March 14 and that I’d have mine on that day! Can’t wait! Congratulations! So glad I did B3 All-in – now I know all about DUTD! Best wishes for a bestseller! …brings tears to my eyes. i ordered one for me, and my 2 nieces. amazon sent an email yesterday saying they are coming sooooooon! thanks andrea for your hard work and deep love and attention to what you offer. as you may remember i lived in pine grove between hood river and park dale in the late 70’s (teaching head-start) and grew many gardens…it keeps me connected…thanks to you. You are such an inspiration – I have felt that connectedness to all when digging in the dirt – there’s something so basic, so elemental in that movement. Pre-ordered book and received notice yesterday of arrival date. Congratulations, Andrea. .. and thank you for being truthful and honest. Andrea, you have every reason to be so proud! What a major accomplishment, particularly in light of the arduous work you handle every single day on your farm. How you found time to create a cookbook is amazing. I just ordered a copy thru your local bookstore, Waucoma, always happy to support a local business. Cheers to you and looking forward to all your inventive recipes. Congrats!!! looking forward to your book event on the 19th….. So very happy for you!! CONGRATULATIONS!!!!! As soon as the book is on Amazon.ca, I’ll be buying it. Congratulations! I ran into your wonderful mum the other day and she was bursting at the seams with joy for you! I love your blog and recipes and cannot wait for the book to arrive at my door! AHhh! This made me all vaclempt! I am so excited for you! I adore your website and your recipes and look forward to the book! Congratulations Andrea! I’m a Texas girl whose been following your blog and making your recipes for a couple of years now after I learned of your website via barre3.com. I’m a huge fan of your healthy and delicious recipes, and I can’t wait to get your cookbook!!! See this is SO wonderful! Such a touching post! 🙂 I hope you will have a book event in Seattle – we’d love to have you! So dang excited for you! Can’t wait to hold this thing in my hands! Andrea, Congratulations!! You have moved mountains – and a lot of vegetables! We are all so happy for you and proud to know you!! Will absolutely order from Waucoma. Gotta have our own signed copy! You almost made me tear up. And these pictures are so candid and heartwarming. Congratulations on overcoming the hurdles and making your dream a reality. What a beautiful story – I am buying a book or two because you ROCK my friend! Congrats Andrea. Concord has very popular cookbook club at Library. We hope you’ll come to a meeting when your visiting next year. We’ll feature your book and cook from it for our lunch. Can’t wait to see it. Jamie said it’s already one of best new cook books. Congrats Andrea. This accomplishment is a just dessert, diary free. Congratulations on the release of your cookbook!!! I work with middle schoolers learning disabilities, including dyslexia. I love finding stories of people with learning disabilities who are finding amazing ways to be successful. I can’t wait to share your story with my kids! Here’s to many more awesome days on the farm! I’ve ordered 3 copies of your book and cannot wait for it- i’m tryingnto teach healthy habits to our 5 children and know your book will be another tool in my box!! But reading your post today made me smile for a different reason. My heart is bursting for you and your mom in gratitude for you both. The liz was the first educator who looked my husband and me in the eyes and said that the catholic school to which we were so committed simply was not the place for our son. It was scary and painful and lonely moving him from a school we thought of as a second family home–at first. Slowly we met new, wonderful, dedicated teachers and friends. Having been identified as a dyslexic learner finally in 5th grade, our son once again enjoys learning and is happy. School remains a challenge- but it is a challenge he now feels confident to meet head on -most days. Your mom has continued to mentor, counsel, and support us for the last 7 years, while sharing tales of your successes along the way. So thank you for sharing your struggles in this week’s post and being a proud, vocal advocate for the fact that the traditional way isn’t the only way. Your story affirms my hopes. Thank you. Thank you for sharing your challenges with us. My daughter is struggling through dyslexia and other learning difficulties as well. Most of her school days are filled with failing grades & teasing friends so success stories mean the world to her. Yours is especially inspiring because she wants to go into agriculture and she loves to cook. There is no better way to work on reading & math skills than reading a recipe!!! Thank you from the bottom of my heart. You are an inspiration! Thank you for sharing your story and your wonderful talents! Congratulations, this is wonderful news! Just bought my copy! Longtime reader here (since the NYTimes article) and am so pumped to get my hands on this book! So stoked to see the book is ready! I just bought one as a birthday gift for my sister. I’m sure she’ll love it! Got the book today -earlier than I thought yay! Sat down to read a little of it and I read it cover to cover in one sitting. What a wonderful book! Congratulations, Andrea, this is a masterpiece. Your recipes are original and approachable, your voice is real and authentic. I love it, and will use your book over and over. Left reviews on both Amazon and Goodreads. A book to use and reuse, and a great gift for the cooks you know. I’ve been a reader of your blogs since 2009 ~ and witness to your eloquent – Yes, ELOQUENT – expression of lives lived with love and dedication. Thank you so much for sharing the magnificence of your many gifts. CONGRATULATIONS!!!!! 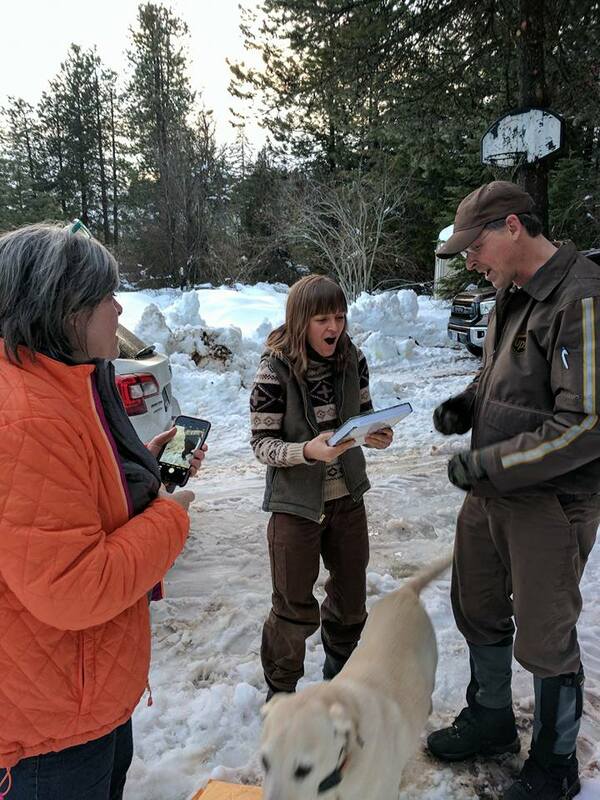 The photos of your book delivery are w derail! Brought a tear of joy. Very happy for you! I just finished reading and reviewing your lovely cookbook! As a former farm girl, I live vicariously through your recipes. Cheers! I just received my copy of your book which was brought to my attention by a video on “Book Perks.” My family is from Vermont and most of my ancestors were farmers, so your book really speaks to me. The pictures are lovely and I love what you write about your life. I can’t wait to try the recipes. I have the greatest respect for people who farm for a living. Thank you for giving us a little peek into your life — and congratulations on a beautiful book. You’re such a huge inspiration to me. I’m starting my second year of farming and hitting many points of self-doubt, scattered between eager excitement. Thank you for sharing your journey! And congratulations on a huge accomplishment! I’m so happy you ordered the book. Thanks so much!